When Mia hit the ground the first words we said were Mia OH Mya – so that is her name. 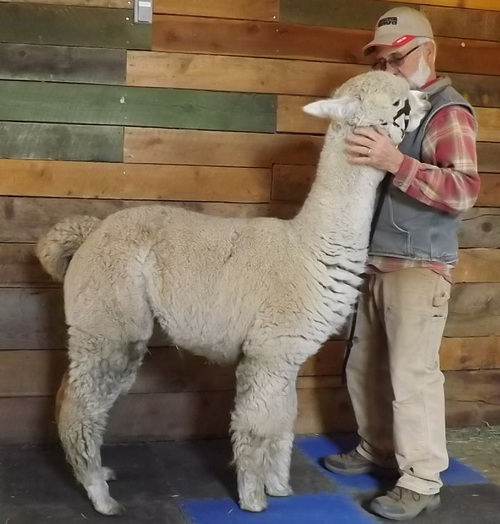 She was lovely from the moment she was born and after she has matured a bit she is still a very impressive looking Alpaca in the graceful way she carries herself and in her conformational correctness and great head. She has black around her eyes like she put on her mascara for a night on the town. 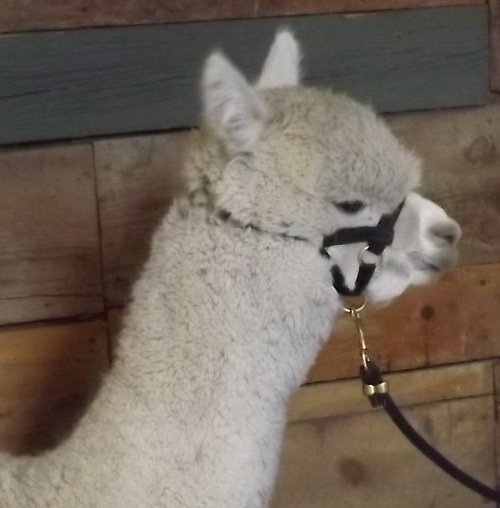 Mia is a very striking looking Alpaca. 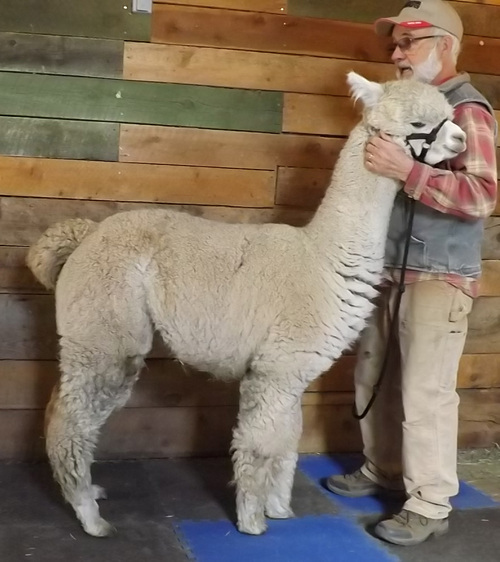 And with a fine dense long light fawn fleece, she is the total package. Mia's 2016 El Nino's Golden Legend is here and and her name is OH- MYA. OH-MYA is a lovely white female who is stunning - fine bright fleece with strong square confirmation. PrairieMoon's OH-MYA Legend has been beautiful and special since she hit the ground. When we first saw her we said Oh-My and that was her name. Mya is a color champion in LIGHT (Mya is a fawn and beat the whites) walking fleece and according to the halter judge (Sharon Loner) would have placed much higher in the halter show placings if her left leg was a little straighter (it is now since a little more time and maturing). 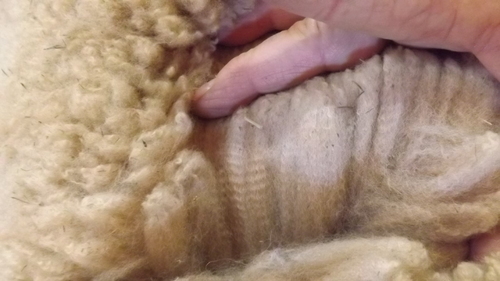 This lady is a complete package - exquisite fleece in every measure, conformationaly correct, pretty, gentle disposition and easy to handle. Mya's fleece is very fine with a soft handle (19 of 20 points), uniform micron (9 out if 10 points), little guard hair (9 out of 10 points), long staple length (4.5 out of 5 points), very bright (8.5 out of 10 points), and a non-fading light fawn (5 out of 5 points). OH-MYA's sire is El Nino's Golden Legend and she is every bit her Daddy's daughter in disposition and bearing. Mya is ready to be bred by your male in the spring 2018 and will bring her blood lines and careful breeding to your breeding program.